Abu Ahmad is a 52-year-old father of eight (four daughters and four sons). His 11-year-old daughter Rukia became paralysed shortly before the violence erupted in August 2017. After arriving in Bangladesh, Rukia spent over seven months at MSF’s medical facility in Kutupalong. She returns to the facility every couple of days to have her bedsores treated. 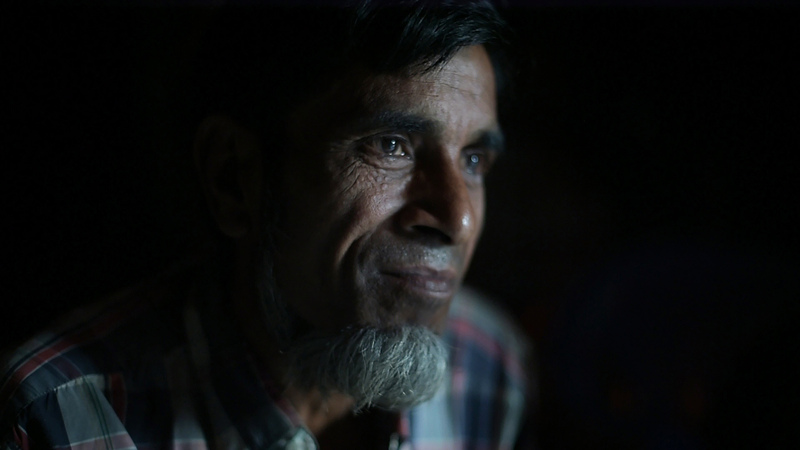 Here, Abu Ahmad recounts how the family fled, what life is like for his family in Bangladesh, and their hopes for the future. “Before the conflict, we had cows, goats, land, all those things. Our business and livelihoods we earnt ourselves. But we faced lots of threats and torture from the government in Myanmar. If someone wanted to get higher education, that person would have to flee the country because if the government found out, they would arrest him. Our movements were very restricted; we were not allowed beyond the checkpoints. We could only move within our area. Other people, like monks and different [ethnic] communities, were free to move around everywhere. Then the conflict began. Fighting, stabbings and the burning of houses. Not long before that, my daughter Rukia had somehow became paralysed. She complained of pain and then stopped being able to feel anything below the waist. One night I called all my children together to discuss what to do. We did not see much hope; we could be arrested or killed no matter what we did. My eldest son told me that when the fighting starts, we would not be able to run with Rukia. “There will be no chance to save her life”, he said. “You and mother should take her to Bangladesh now, ahead of us. We can join you later.” So I told my other children to get ready, and my wife and I left for Bangladesh with Rukia. After we left the house ... we were unable to [openly] leave our village because everywhere we looked we saw government people with weapons. We trekked miles through the mountains, hiring men to carry Rukia. We finally arrived at the shoreline opposite Bangladesh late at night. By the time a boat eventually came into view, there were around 20 to 30 other people at the shore with us. The captain took all of us safely across to Bangladesh. When we arrived, the Bangladeshi border police were waiting. They helped us a lot; welcoming us and giving us food, water and biscuits. In the morning they hired a bus and brought us to Kutupalong camp. I was anxious after we got off the bus. We had never been to Bangladesh before. I didn’t know where to take my sick daughter and I was asking everyone I saw. People told us about the MSF medical facility in Kutupalong. The medics there took Rukia from my arms and admitted her as a patient. She spent almost seven and a half months at the hospital. She had X-rays, blood transfusions and was seen by the doctors several times a day. We were given regular meals. When I left Rakhine with my wife and Rukia, things hadn’t yet become so bad. It became much worse than we thought was possible. After arriving in Kutupalong, I had no news from my seven children that were left behind. Other people told us that our house had been set on fire and that our children had fled. We didn’t have a phone or any other way to contact our children; we were so worried. After some time, we heard from people that they had arrived in Bangladesh and were looking for us. They made it to Kutupalong and were able to find us at the MSF facility by asking people about Rukia. When I was finally reunited with my children after two months, I began to feel calm again. I was so happy to have my children back, I felt like I had my world back. The government gave us wood, bamboo and plastic sheeting to make a house here. We get rations of oil, rice and dhal [lentils]. We sell some of the oil and dhal they give us. After that, we buy some fish, vegetables and chillies. The reason why we sell some of our dhal and oil is so we can earn between 100-200 Taka [1-2 euros]. Even if we don't have money, we have to survive. With that 100 or 200 Taka, we have to survive for one month. Sometimes we can eat such food, sometimes we cannot. We don't have any income. If we could work, life would be easier. We aren't given the chance to do so. I have no opportunity to work and I've lost my strength. I cannot work outside and earn money to feed my children. It’s very hard with Rukia in the camp. Because she is disabled, we have to take her out of the camp to the hospital and bring her back every few days. The path from the house to the road is very difficult. The camp has so many ups and downs, and I have to carry her in my arms. I have to get the wheelchair MSF gave us onto the road, then I have to come back and carry her to it. Then I have to push her in the wheelchair to the hospital. I couldn’t find any space in the camp that’s flat to build the house on. If I had money, then I could take her to hospital by bus and I could avoid this pain. The hospital has done so many tests and treatments, but we still don’t know why Rukia became paralysed. I am always asking God to help her walk. Sometimes she asks me to take her abroad, so she can get treatment and study. When she says such things, I become more upset. I become more worried and feel so stressed. I've lost my strength, my ability to work. I always have so many worries; worries about the future. I think about food, clothes, peace and our suffering. If I have to stay in this place for 10 years, five years, four years or even for one month, I will have to suffer this pain. If Rukia could move around, she would be happier. She asks me to move her around in the wheelchair, but because the camp is so hilly, I cannot do so. It is too hard for me to take the wheelchair through the hilly camp. I am in too much pain because I have to carry Rukia around.